The view from the top was beautiful. Surrounded by a range of hills, all covered in fog and the wind blowing through your hair. Just when you were told and you had to go down again to climb the other peak. 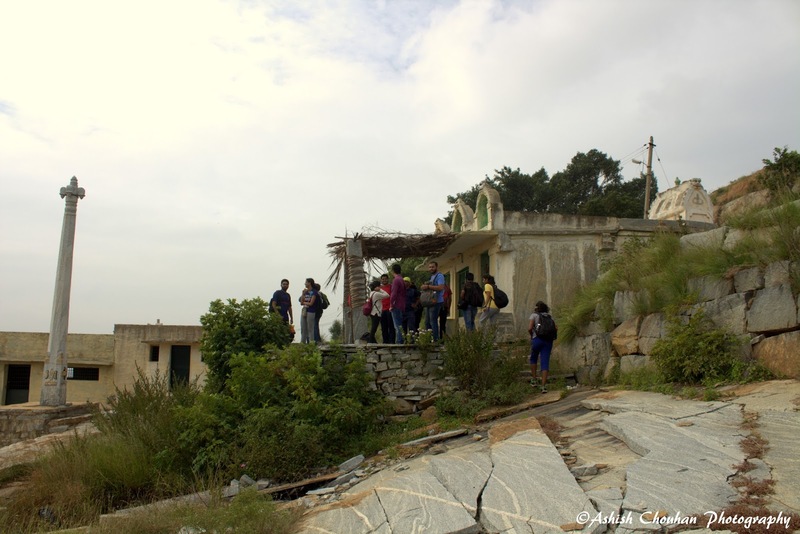 Kaurava and Pandava Kunda are joint twin peaks in the district of Chikkaballapura near Bangalore. Twenty of us from the Bangalore Trekking Club (BTC) started from the Kempegowda Bus stop (majestic), Bangalore at around 7.15 am on a bus to Chikkaballapura. We all sat in the last rows of seat. Being on the moving KSRTC bus did not stop us from the traditional BTC introduction of telling everyone your name by enacting it. It was one of the funniest bus journeys. We all got introduced to one another and some of them had opened their tiffin box already when we reached Chikkaballpura. We got off the bus and took a ride from there to the peak in what looked like a cross over between an Omni and an auto rickshaw. We started our ascend to a view that looked like this. It was sad to see the peak surrounded by quarries and all the rock being taken away. Perhaps soon even these peaks will succumb to it. Ashish and Amol, our BTC organisers. 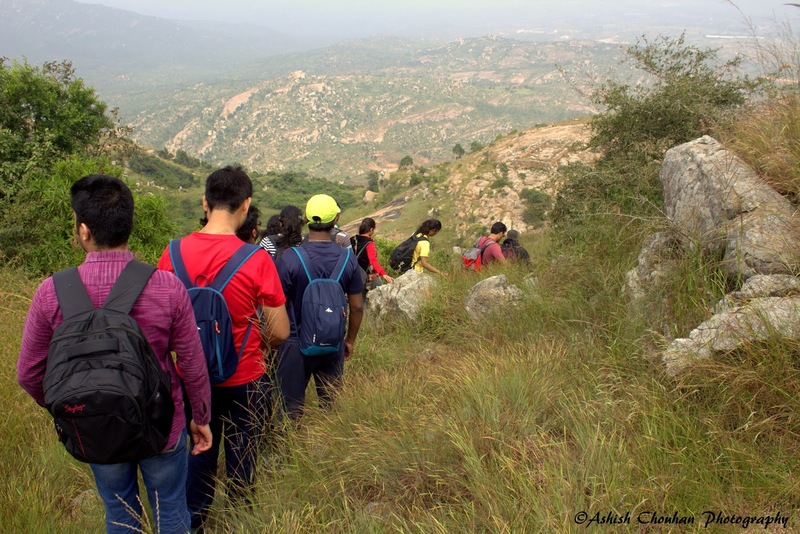 Amol led the group while Ashish trailed at the end ensuring everyone was ok. 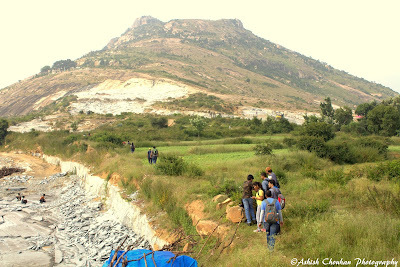 It was rocky hill with green patches. The green patches had grass growing up to around 2 feet with a lot of thorns. A short while later all of us reached the Ranganatha temple situated midway on the hill. 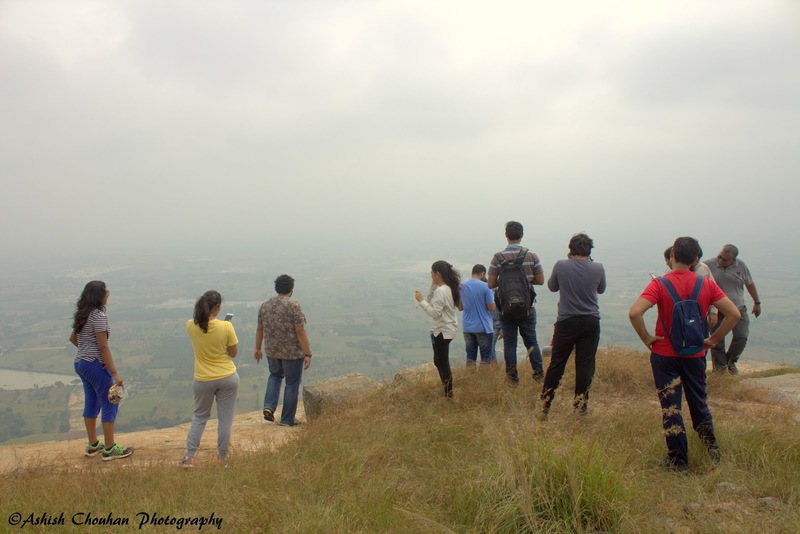 We continued our climb to the peak talking to each other, clicking pictures, enjoying the fresh clean air and thanking the sun for being kind. It was surprisingly not sunny at all. It was perfect weather. Finally we reached the top of the hill and it was selfie time! Everyone was soaking themselves in the fresh air and soon got busy getting their next profile pic taken. Soon our organisers reminded us our job was only half done. We had another peak to climb. We started walking down to start all over again with the other peak. The other peak was just as beautiful. 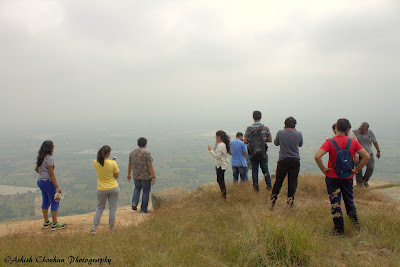 This time everyone just sat together gazing at the vast expanse around. After a hard day’s work we deserved some tasty food. Boxes closed, cameras out. The photographers got clicking again. After all the posing session, it was time to walk down. We got a bit lost not knowing how we had climbed up. We decided to just follow a path and start walking. Soon we were at the foot of the hill. All of this in just half the day. We gathered around for a feedback to the BTC organisers. Everyone said their versions of “it was a wonderful trek”. 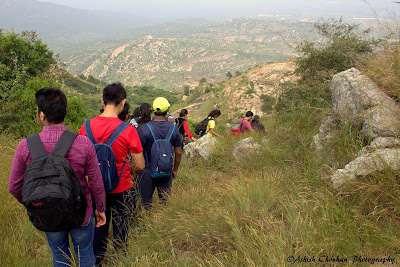 It was lovely day, well spent and an enjoyable trek. We reached Bangalore at around 6 pm, each of us getting off at points close to their residence, saying bye to the group and waiting for the next trek.